In my previous post we had a small competition running to win a Bruce Spizer additional booklet for “The Beatles on Capitol Records Vol.1” CD set. 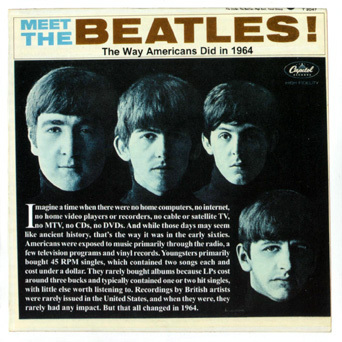 The easy question was: “Meet The Beatles!”, one of the US Capitol records included in the box set, features the same striking black and white cover photo as the British LP “With The Beatles”. Who took that photograph? Of course the answer was Robert Freeman. Incidently, that Robert Freeman photograph used for both “With the Beatles” and “Meet The Beatles!” has a connection to this post about a new book out recently called “Yeah Yeah Yeah – The Beatles and Bournemouth”. The Freeman shot was actually taken on 22 August, 1963 in the Palace Court Hotel in Bournemouth, England. Thank you to all those who submitted entries. This entry was posted in Beatles, Beatles Books, Beatles Collecting, Beatles Music and tagged Beatles, Beatles Books, Beatles Collecting, Bruce Spizer, Music, Robert Freeman by beatlesblogger. Bookmark the permalink. Hi, Where can i buy one of this? Thanks. (Also, the link we had in our initial post about the booklet has now been updated).